Enoch Wood historical Staffordshire dark blue transfer plate, Moulin sur la Marne a Charenton, from the French series. Circa 1825. Pearlware with grapevine border and with pottery's impressed WOOD mark and underglaze blue pattern name. Size: 9 1/8" diameter. 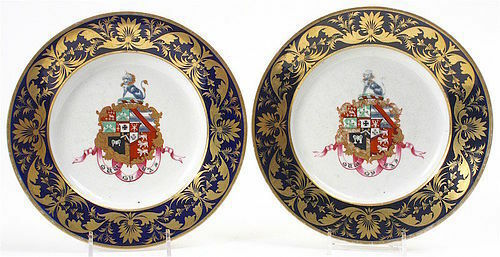 Condition is very good apart from some light staining to reverse of plate. 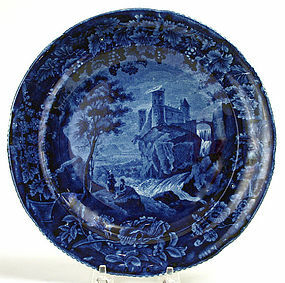 Vue d'une Ancienne Abbaye Staffordshire historical plate by Enoch Wood. Circa 1825. 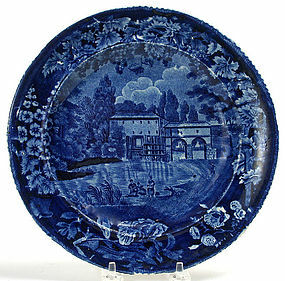 This pearlware plate is decorated in a dark blue transfer and is from the "French series." It has a grape vine border and bears on the back the pottery's factory impressed mark WOOD as well as the pattern name in an underglaze blue stamp. Size: 9" diameter. Condition: Very good with a couple of very small pin sized flecks to the glaze and some fine crazing. 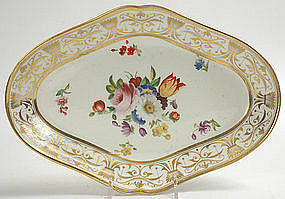 Lozenge shaped porcelain serving dish from an English dessert service, decorated with an ornate gilded scroll border and with a central hand-painted reserve of summer flowers. Unmarked. Circa 1815-1820. Size: 11" x 7.5" Condition is excellent; no chips or lines; hardly any wear to the gilding or flower painting. Possibly Spode or Coalport. See other pieces from this service in our on-line gallery. 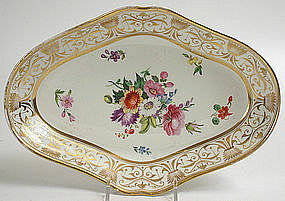 English lozenge-shaped porcelain serving dish from a dessert service, embellished with a wide, elaborate gilded scroll border surrounding a central hand painted bouquet of summer flowers. Unmarked. Circa 1815-1820. Possibly Spode or Coalport. Condition: some minor wear to the gilding on the rim; no cracks or lines. Size: 10 3/4" x 7 3/8". Other pieces available from this service. 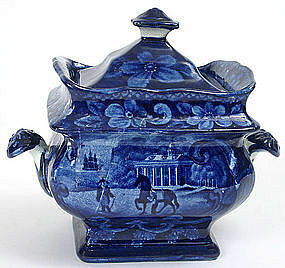 Historical Staffordshire dark blue covered sugar bowl with transfer of Washington at Mount Vernon. Unmarked, early 19th century. Condition: light staining to interior of bowl and some minor glaze roughness; professional restoration to cover, not visible from exterior but showing under black light and with some color variation to the inside of the cover (see photo). Size: 6.5 inches long x 4 inches deep x 5.75 inches high. Royal Bonn scenic vase with encircling sunset landscape with lake, islands and mountains, above a band of purple flowers. 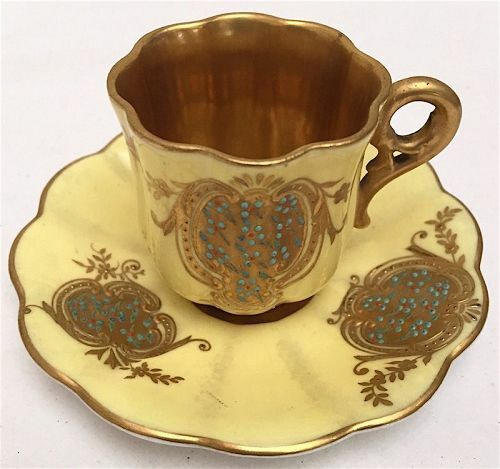 The rim and foot are shaped and molded, covered with rich gilding. Signed by the artist J. Thiesen and fully stamped on the underside with the manufacturer's marks. Circa. 1890-1920. Size: 7" high x 4.5" diameter. Mint condition. Worcester, Grainger and Company hand painted topographical plate with scenic view of Robert Burns' cottage and a scrolling, embossed border. Circa 1894. #5083. Size: 8.5" diameter. Condition is excellent with no damage or repairs. Hand painted fish plate by George Jones & Sons, England. Circa 1900-1920. Yellow glazed, gilded scalloped border with central hand-painted reserve of fish and aquatic plants. Made for J.E. Caldwell, Philadelphia. Excellent condition. Size: 8.75 inches diameter. Royal Worcester cylindrical porcelain scenic vase with reticulated rim and with hand painted view of St. Mary's Abbey,York. Circa 1906. #689/G. Excellent condition. Size: 3.5 inches ht. x 2 inches diameter. See similar matching vase on this site. Royal Worcester porcelain cylindrical vase with reticulated rim and with hand painted scene of Holyrood Castle. Circa 1905. #689/G. Size: 3.5 inches ht. x 2 inches diameter. Excellent condition. See similar matching vase on this site.